HadCon is a general purpose IO module for detector and experiment control as well as for small data acquisition systems. (HADControl general purpose board) Since its first application has been a power monitor for the Hades Shower Detector it has been formerly introduced and well known as HadShoPoMo (Hades Shower Power Monitor (HADControl/HadShoPoMo general purpose board). HadCon has an SoC on-board, ETRAX 100LX MCM 4+16 from AXIS (Wikipedia: en/de) - which will be discontinued, see the new HadCon2. Running a standard Linux the Etrax provides "Connectivity to the world" via TCP/IP. 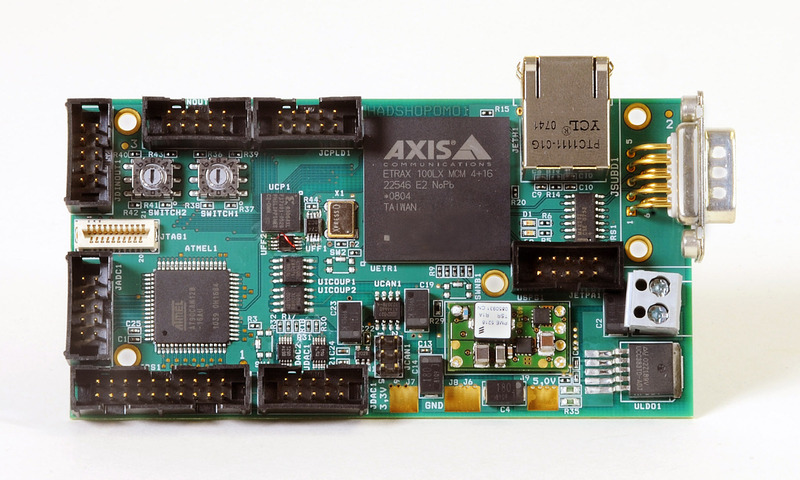 On the other side it connects via its internal serial interface to an ATMEL AT90CAN128 microcontroller and optionally to an Xilinx CPLD. Via this junction the ATMEL provides a multitude of possible connections to field buses and general I/O ports. &approx;≥ 6V (, < 5 W), 5.5V to 8 V.
When driving 1-wire devices, typically via JDINOUT2, make sure to have (at least) 1 pull-up resistor of about 3.3kΩ on the data line of the 1-wire bus connected to the power VDD. Possible option for future, directly at the connector, when using one of JDINOUT2's pins as permanent power pin. to be able to transmit up to baud rates of 115200 you have to manipulate the hardware of the hadcon. The clock signal of the oscillator X1 is 20 MHz. It is scaled down by two flip-flops (UFF1, UFF2) first to 10 MHz and then to 5 MHz. Therefore UFF2 has to be bridged or short-cut, i.e.